Christians of various denominations cherish baptism and the Lord’s Supper in some form. Baptist beliefs about baptism and the Lord’s Supper differ from those of many other denominations. 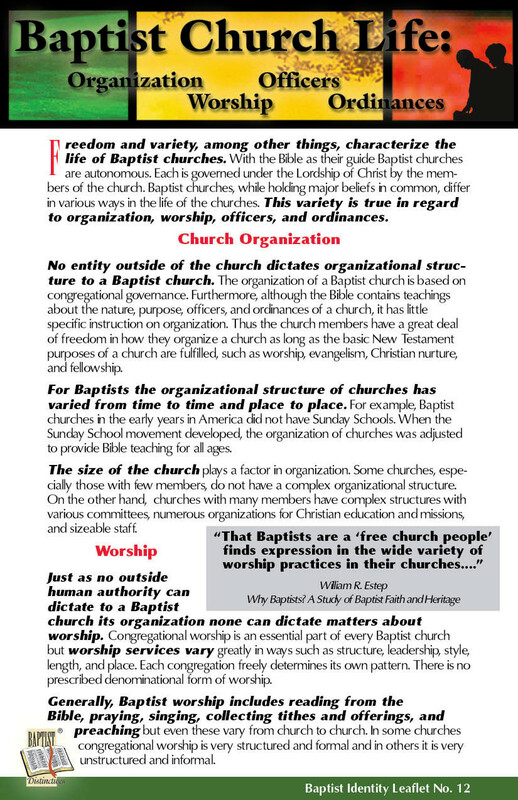 These differences are some of the ingredients in the distinctive Baptist recipe of beliefs and practices. 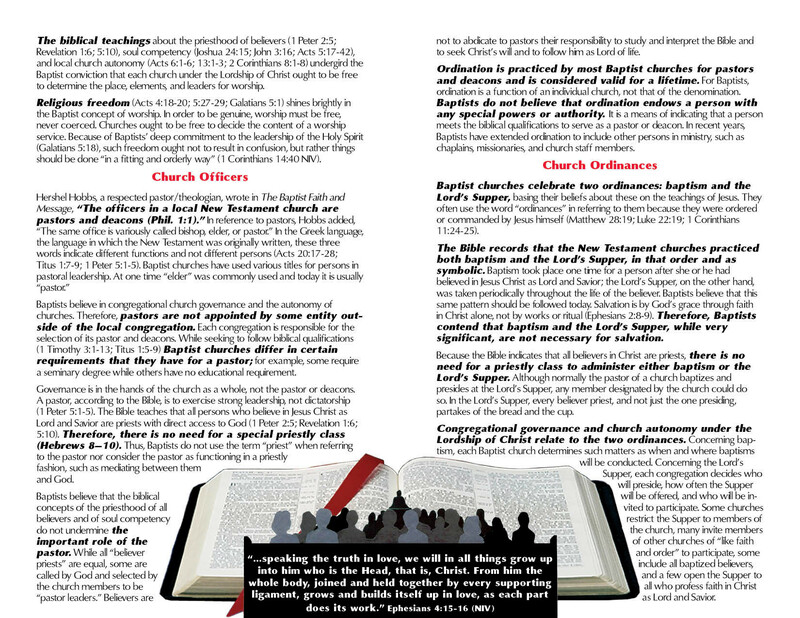 Baptists usually use the term “ordinances” rather than “sacraments” when referring to baptism and the Lord’s Supper. Even if “sacraments” is used, it is never intended to imply that either of these two is necessary for a person to be saved. Baptists consistently declare that baptism and the Lord’s Supper are symbols and are not necessary for salvation. They are nonetheless a significant part of Baptist practice and worship. 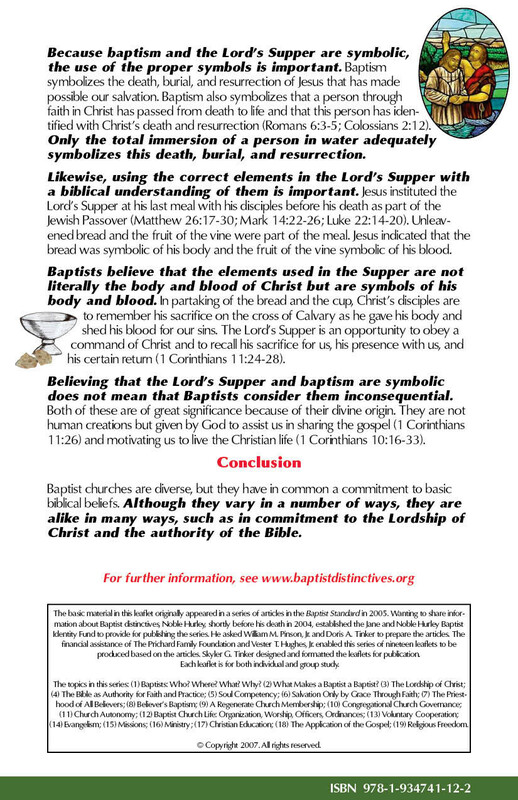 Because baptism and the Lord’s Supper are symbolic, the use of the proper symbols is important. Baptism symbolizes the death, burial and resurrection of Jesus that has made possible our salvation. Baptism also symbolizes that a person through faith in Christ has passed from death to life and that this person has identified with Christ’s death and resurrection (Romans 6:3-5; Colossians 2:12). Only the total immersion of a person in water adequately symbolizes this death, burial and resurrection. Likewise, using the correct elements in the Lord’s Supper with a biblical understanding of them is important. Jesus instituted the Lord’s Supper at his last meal with his disciples as part of the Jewish Passover (Matthew 26:26-30; Mark 14:22-26; Luke 22:14-20). Unleavened bread and the fruit of the vine were part of the meal. Jesus indicated that the bread was symbolic of his body and the fruit of the vine symbolic of his blood. The unleavened bread symbolizes the purity of Christ, for he was without sin (Hebrews 4:15) and thus his body was an unblemished sacrifice for our sins. The juice from crushed grapes symbolizes the blood that Christ shed for us. In partaking of the bread and the cup, Christ’s disciples are to remember his sacrifice on the cross of Calvary as he gave his body and shed his blood for our sins. Baptists believe the Bible teaches that the elements used in the Supper are not literally the body and blood of Christ. They are symbols of his body and blood. In eating the bread and drinking from the cup, a person does not actually partake of Christ’s flesh and blood. Rather, it is an opportunity to obey a command of Christ and to recall his sacrifice for us, his presence with us and his certain return (1 Corinthians 11:24-28). Believing that the Lord’s Supper and baptism are symbolic does not mean that Baptists believe they are inconsequential. Baptists believe that both of these are of great significance. They are important because of their divine origin. They are not human creations but given by God to assist us in declaring and sharing the gospel (1 Corinthians 11:26) and motivating us to live the Christian life (1 Corinthians 10:16-33; 11:29). The act of baptism affords opportunity for a person who is being baptized to testify publicly that he or she has trusted Jesus as Lord and Savior and experienced forgiveness of sin. The person doing the baptizing can utilize the experience to explain the nature of salvation and the meaning of baptism. The Lord’s Supper provides an opportunity for both evangelism and Christian growth. The Supper movingly emphasizes the love of God that led Jesus to give himself a sacrifice for sin. For believers, the Supper affords a time for special communion with the Lord, expressing thanks for his sacrifice that enables us to be forgiven of our sin. Thus the Lord’s Supper is also referred to as Communion. Baptist beliefs about baptism and the Lord’s Supper do not stand alone. 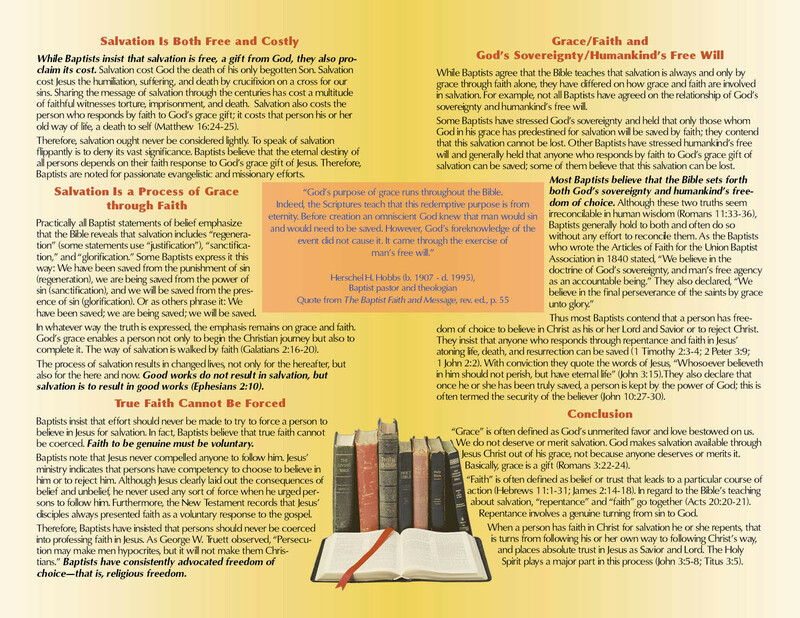 They are closely related to each other as well as to other cherished Baptist doctrines. Baptism and the Lord’s Supper are interrelated. Baptists believe that the Lord’s Supper should be taken only by those who have been born again and baptized. 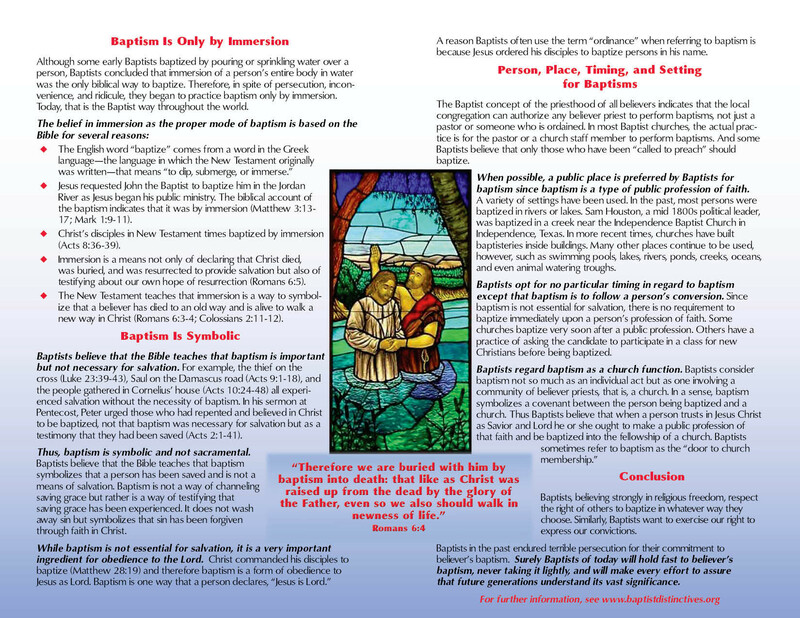 Baptists base their beliefs on the Bible, including beliefs about baptism and the Lord’s Supper. The Bible records that the New Testament churches practiced baptism and the Lord’s Supper, in that order and as symbolic. These churches were made up of persons who had been saved and baptized. Baptists believe that this same pattern should be followed today. 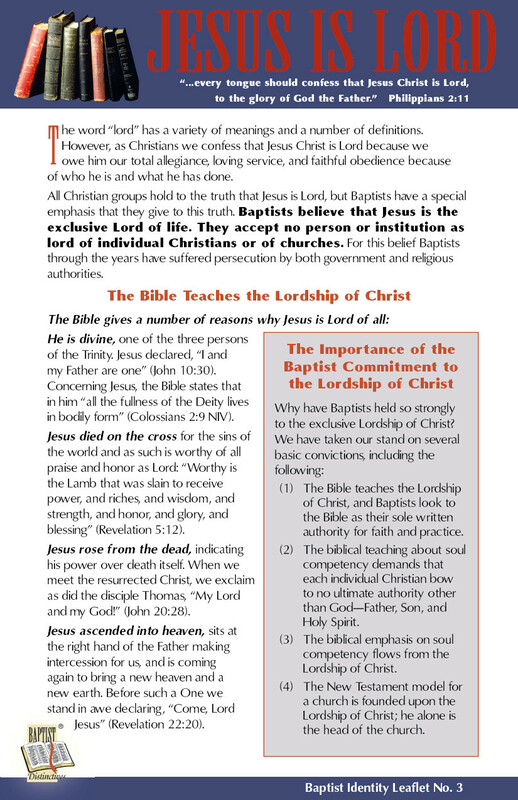 Believing in the lordship of Christ, Baptists base their beliefs about baptism and the Lord’s Supper on the teachings of Jesus. Baptists often use the word “ordinances” in referring to them because they were ordered or commanded by Jesus himself (Matthew 28:19; Luke 22:19; 1 Corinthians 11:24-25). Baptists insist that salvation is by God’s grace through faith in Christ alone, not by works or ritual (Ephesians 2:8-9). Therefore, Baptists contend that baptism and the Lord’s Supper, while very significant, are not necessary for salvation. Because the Bible indicates that all believers in Christ are priests (1 Peter 2:5; Revelation 5:10), there is no need for a priestly class to administer either baptism or the Lord’s Supper. Although normally the pastor of a church baptizes and presides at the Lord’s Supper, any member designated by the church could do so. In the Lord’s Supper, each believer priest, and not just the one presiding is, to partake of the bread and the cup. Soul freedom relates to baptism and the Lord’s Supper in that a person’s participation in each ought to be voluntary, never forced. 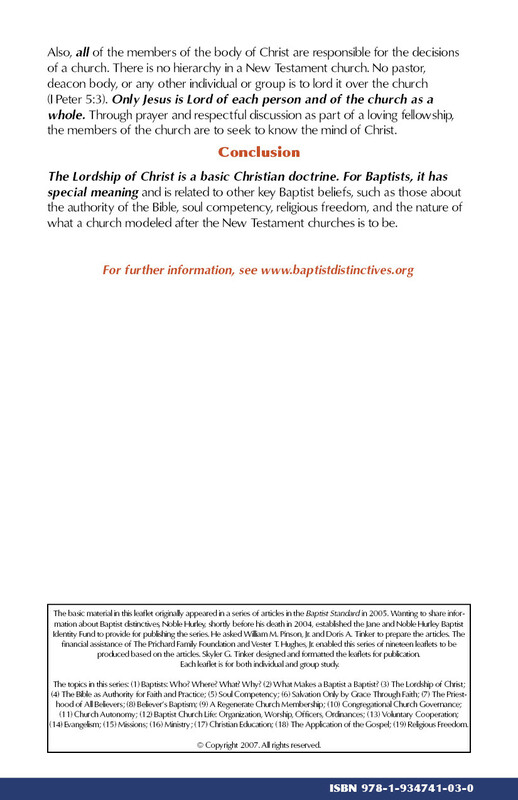 Baptists have consistently advocated freedom of religion, insisting that no one be coerced to participate in any religious act, such as baptism or the Lord’s Supper. 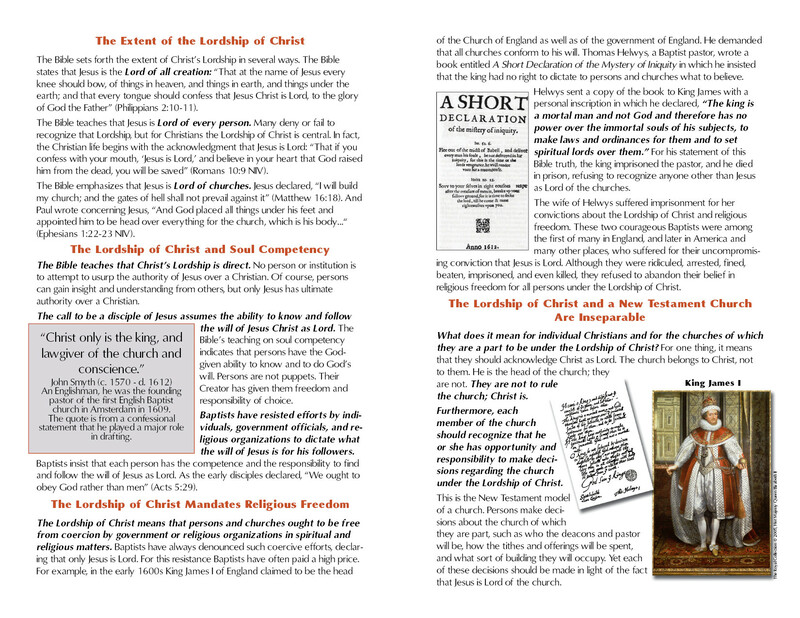 Congregational governance and church autonomy under the lordship of Christ relate to the two ordinances. 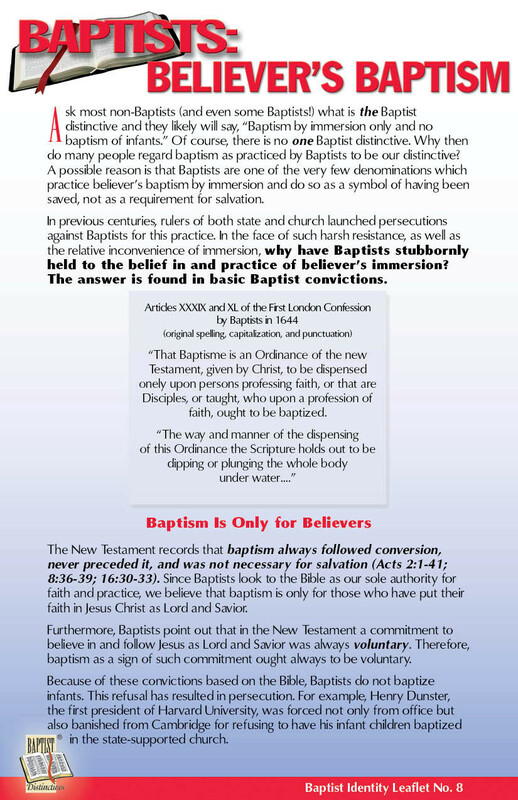 Concerning baptism, each Baptist church has the right to determine such matters as when and where baptisms will be conducted. Concerning the Lord’s Supper, each congregation decides who will preside, how often the Supper will be offered, and who will be invited to participate. In regard to the latter, some churches restrict the Supper to members of the church, many invite members of other churches of “like faith and order” to participate, some include all baptized believers, and a few open the Supper to all who profess faith in Christ as Lord and Savior. Baptists believe that Jesus gave two ordinances to be carried out by a church: baptism and the Lord’s Supper. 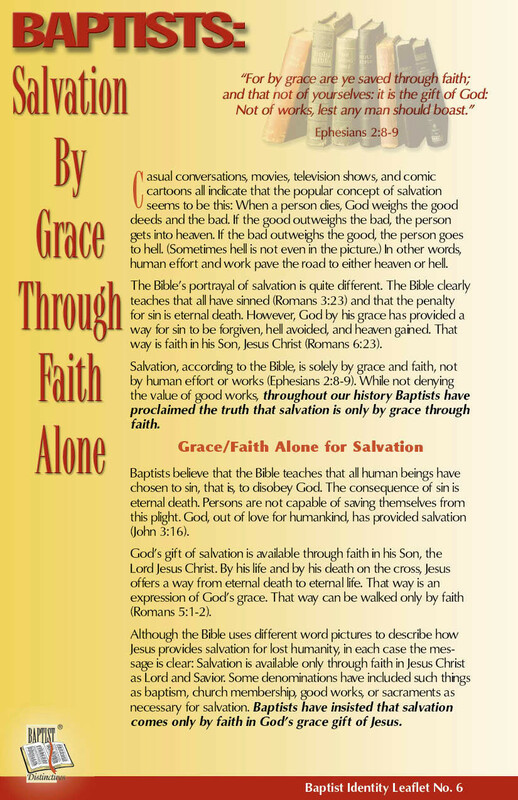 Each of these is both symbolic and highly significant because each symbolizes the Christian message of grace and salvation and relates to other major Baptist doctrines.